The concept of windfield-source-basin system is more of a methodology than a theory. Windfield-source-basin system aims to study a system in the basin scope. Sub-elements included in the system that are needed for the study include wind direction, wind strength, provenance, topography, water depth, and so on. 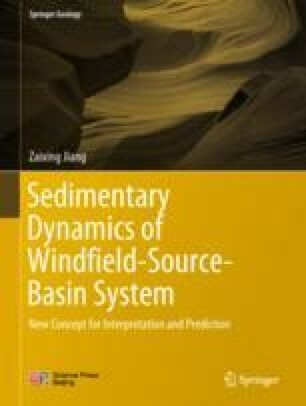 Reconstruction and/or interpretation of the above sub-elements are the key of the windfield-source-basin methodology, which would result in a more reasonable interpretation of complex sedimentary processes and products, and even predict sedimentary processes and products in unexplored regions. In this chapter, how would the above sub-elements influence the development of depositional systems are discussed, and general methodologies are presented, to outline this practical approach. A classification scheme of depositional systems was suggested in the framework of windfield-source-basin system.